Sam vs. Lupus: With Many Thanks! 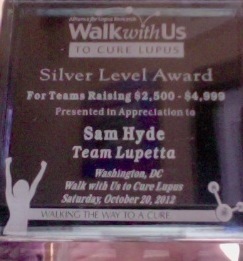 Yesterday, much to my surprise, I received a plaque in the mail from the Alliance for Lupus Research (ALR) It was given in recognition of my team's fundraising efforts for the DC Walk for the Cure. It really shouldn't have my name on it...it should have all of your names, as so many of you donated so generously to our team. So, once again, thank you, and know that the ALR thanks you too! You worked harder to earn it.